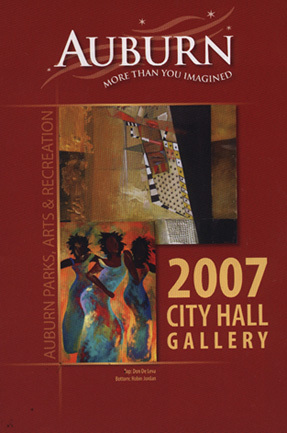 I win the Call for Artists of the Auburn City Hall Gallery 2007. Please join us for light snacks and the opportunity to meet Redmond artist, Anne Simernitski and South County Featured Artist of the Month, Cole Adams! The abstract collage works of Redmond artist Anne Simernitski and the saturated watercolor works by Featured SoCo Artist of the Month, Cole Adams, usher in a vibrant New Year. Their works are featured in January and February as part of the City Hall Gallery annual exhibition of emerging and professional Puget Sound artists. On Friday, Feb. 9, the public is invited to experience a unique opportunity to meet and chat with the artists, enjoy light snacks and view the new exhibit from 4:30 to 6 p.m. The City Hall Gallery features emerging artists from around the Puget Sound, as well as new works by established artists. 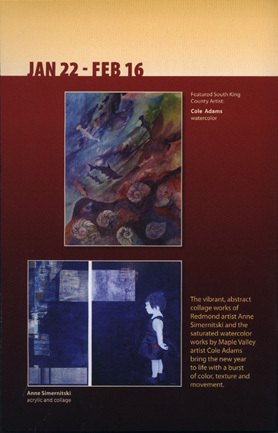 Each show also features a special exhibit of works by local South King County (SoCo) artists. The gallery is located in the main loby of City Hall, 25 W. Main St. Hours are 8 a.m. to 5 p.m., Monday through Friday. Admission is free. Meet the Artists Reception, Friday, Feb. 9, 4:30 – 6pm, City Hall. for there dedication to the artists, there hard work and there kindness.